It's time to get you the best yoga bag so you can take all your yoga goodies with you! 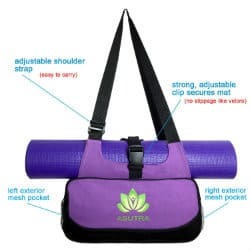 If you practice yoga in a studio or somewhere else, you've surely thought about a suitable bag to carry your yoga mat and probably the rest of your accessories for your practice such as yoga blocks, a change of clothes, bottle of water, etc. So ideally we want to help you find a type of bag that's practical, light, affordable, and specifically designed for yoga-related products. Some of the bags are meant for light packing where they can only carry a couple of things, while others are more versatile and suited for various activities. 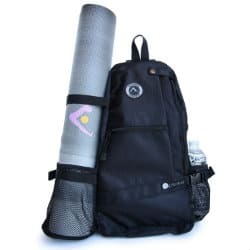 In this review, we will introduce you to some of the greatest yoga bags on the market hoping that and after reading this review, we hope that you will be able to pick the best yoga bag for you. Aurorae is a family business founded in 2009 by Dennis Ingui. All of their products are highly popular, and Aurorae's yoga bag is no different. It is highly versatile and suitable for when you want to take your yoga mat on a long trip with you. It has several pockets of various sizes that will be more than enough for you to store everything you need for your yoga practice, including yoga blocks. It's suitable for yoga mats that are under 5 pounds, which is not a serious limitation as very few yoga mats are heavier than that. 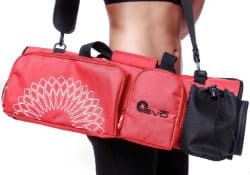 Since it's multi-purpose, it's a bit more expensive than the rest of the bags in this review, but its place among the top yoga bags justifies the price. Asutra designed this bag for women who like to travel light. It's not suitable to store lots of equipment but it is enough for a yoga mat, wallet, bottle, etc. It's eco-friendly as it's made of 100% cotton. Even though it's not too big (16" L x 8"H), it does offer several compartments of various sizes. It's designed in a way that your mat is on the top of the bag and always on the open, which means it can breathe and by the time you get back from your yoga class, it's properly aired. Many users consider it to be the best yoga mat carrier, not to mention it goes great with those stylish yoga pants you might be wearing! Yoga EVO is a highly specialized company that produces only yoga straps and yoga mat bags. This allows them more focus which results in quality and thoughtfully designed yoga bags. Their bag has offers 5 pockets and it's designed in a way that both ends are open. So while your yoga mat is completely protected, it gets properly aired so you don't have to worry about odor. It has an adjustable shoulder strap which allows you to wear it in several different ways, for your convenience. Double Velcro straps make sure that your yoga mat won't slip out, no matter how big or small it is. 5-year warranty make this yoga bag a great investment and a strong contender for the best yoga bag on the market. Gecko Active's mission is to provide quality, yet affordable yoga bags with all the features you need. Beside picnic blankets, yoga bags are the only other product they manufacture. Their bag is fully closed, but it uses a dual air flow technology that makes sure your yoga mat breathes and doesn't get smelly. With its dimensions of 28''L x 7'' diameter, most yoga mats will fit in there easily. It's made out of double-lined cotton with high-quality stitches and zippers. Three storage pockets are there for your essentials. Gecko Active offers a 6-month guarantee, which is not much, but it's enough to decide if this bag works for you or not. Gaiam is a large company based in US. They produce all sorts of yoga and fitness equipment. This is another fully closed yoga bag but it's made out of 100% cotton and designed in a way that allows your yoga mat to breathe. You can't carry a lot of stuff besides your yoga mat, but it does offer several smaller compartments for essentials, such as cellphone, wallet, and keys. If that's all you are looking for, this could be the bag for you. as it's one of the cheapest on the market. 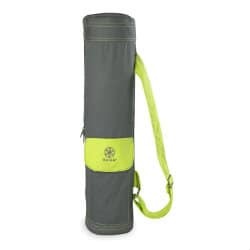 It's not the best yoga mat bag on the market, but it does provide an inexpensive solution for people who want to travel as light as possible. When deciding what kind of yoga bag would you like to buy, always think about what do you usually carry with you. If you carry lots of stuff, including yoga blocks, and want your bag to be more than just a yoga mat carrier, Aurorae's bag could be perfect for you. If you want to walk around town with minimum encumbrance, Asutra's yoga bag will work just fine for you. If you're just looking for the cheapest yoga mat carrier, and don't care about extra features, Gaiam's bag could be your solution. No matter which one you choose, just make sure that your yoga mat will fit in it. 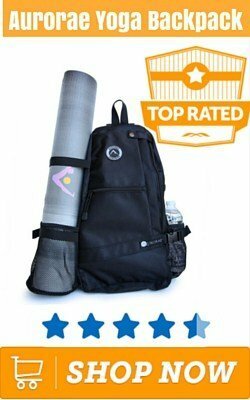 The post Review: What Is The Best Yoga Bag appeared first on MyFreeYoga.